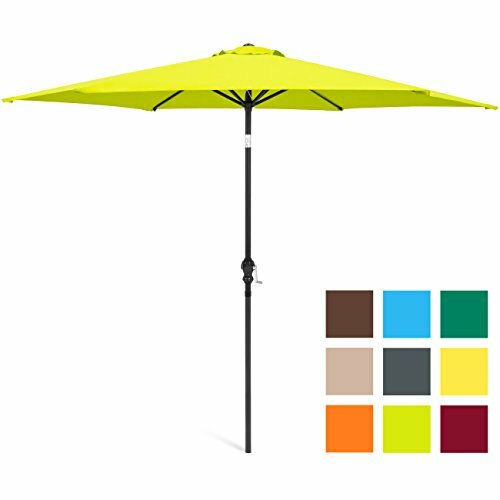 Keep your outdoor living space nicely shaded with this 10-foot patio umbrella. Crafted with water- and UV-resistant polyester and a rust-free steel frame, this umbrella will stand the test of time. A convenient crank handle allows easy opening and closing, while a tilt push button located on the pole body lets you adjust according to the sun's location. Give yourself a new incentive to relax outdoors. PLEASE NOTE: Umbrella base not included. BASE NOT INCLUDED; Overall Dimensions: 10'(Dia) x 100"(H); Pole Diameter: 1.5"